What is Home Wi-Fi Mesh Technology? Mesh networks have existed for quite some time. In fact, the Internet is a giant mesh network consisting of various router nodes with interconnections to each other. Each interconnection may have different characteristics like congestion, path delay (latency), and capacity (bandwidth). Routers prioritize their paths by minimizing congestion and latency, and maximizing capacity. For example, router A communicates with router C via router E even though it has a direct path to router C. The direct path has a lower capacity in the example, 25, as compared to 50 if it relays the communication via router E.
Wireless mesh networks, like Internet routing nodes, perform a similar function – the difference being that the interconnections are achieved using wireless links. This brings about unique and dynamic challenges regarding how mesh networking algorithms are implemented. In 2002, when 802.11b and 802.11a based products became available in the market, I was co-founder and principal architect for one of the first commercial wireless mesh networking companies, Meshdynamics. At the time, most wireless mesh networking products focused on delivering outdoor wide-area Wi-Fi. The idea was to enable service providers/carriers to provide city-wide Wi-Fi access to end-user devices such as notebook PCs, Palm, and Windows mobile PDAs (like we do today using smartphones and LTE). 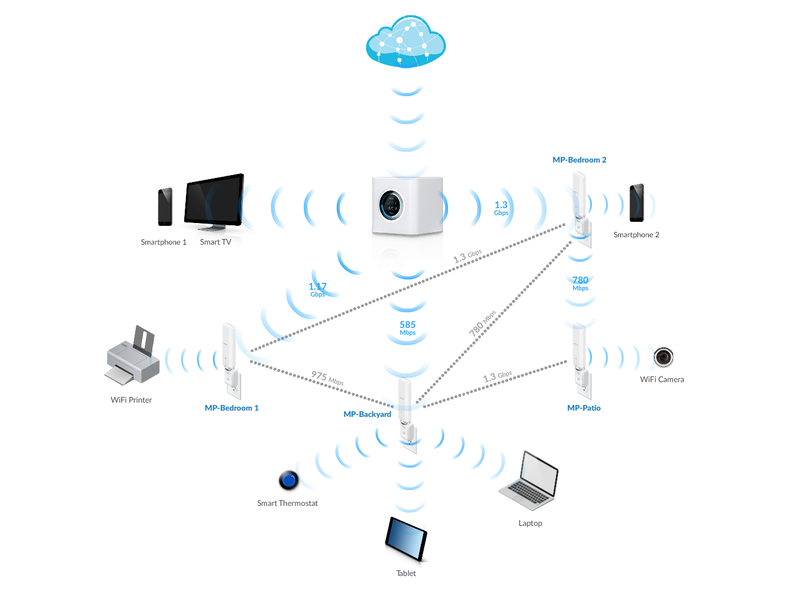 Fast-forward to 2016: as CTO, I am excited to write about Ubiquiti’s Wi-Fi mesh networking technology in our AmpliFiTM home Wi-Fi system. The AmpliFi Mesh Point scans the environment and selects the best path back to the AmpliFi Router. The path selection process takes into account various metrics like signal strength, link capacity, packet error rate, etc. and also involves a preference for hop or relay minimization to reduce latency. The following diagram depicts the selected paths with waves of blue. For example, Mesh Point-Patio prefers to relay via Mesh Point-Bedroom2, whereas Mesh Point-Backyard directly talks to the Amplifi Router. This is because the direct path capacity still beats the cost of relaying via both Mesh Point-Bedroom 1 and Mesh Point-Bedroom 2. 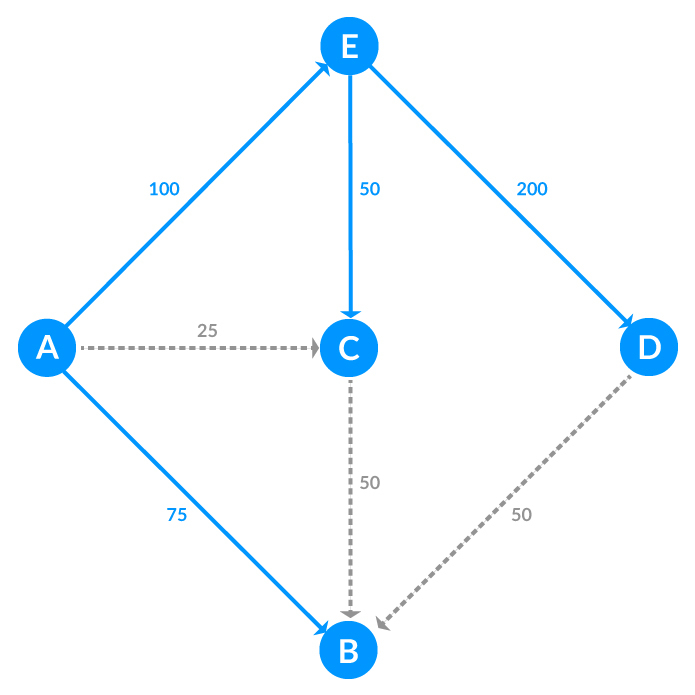 Even after Mesh Points choose their preferred paths back to the AmpliFi Router, they still know about alternatives (shown with gray dotted lines). For example, there could be a situation for which Mesh Point-Bedroom2 needs to be temporarily powered off. In this case, the Wi-Fi camera connected to Mesh Point-Patio can continue to stream to the Internet, after Mesh Point-Patio dynamically shifts over to Mesh Point-Backyard. Self-healing also comes into play if there are temporary obstructions to the wireless link. For example, if the link between the Router and Mesh Point-Bedroom 1 gets weaker temporarily, it can seamlessly shift over and relay via Mesh Point-Bedroom 2, until the obstruction no longer remains. Similar to the relay- or hop-minimizing algorithm used by wireless mesh, the AmpliFi system can automatically minimize the wireless relay hops for client Wi-Fi devices by steering them to the Mesh Point closest to the Router, or the Router itself. Looking forward we will be introducing the same wireless mesh technology in upcoming UniFi® AC products, to enable outdoor enterprise wide-area Wi-Fi. Mesh Technology as explained by CTO at Ubiquiti Networks, Sriram Dayanandan.